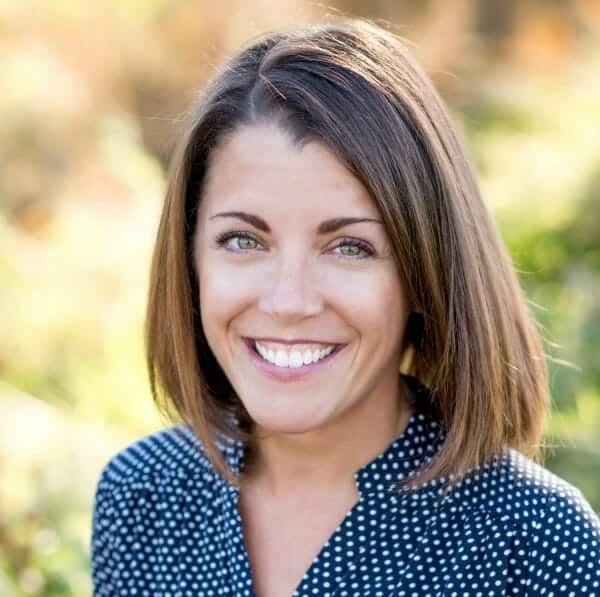 Today, I am so excited to welcome Amy from Rock Your Homeschool. 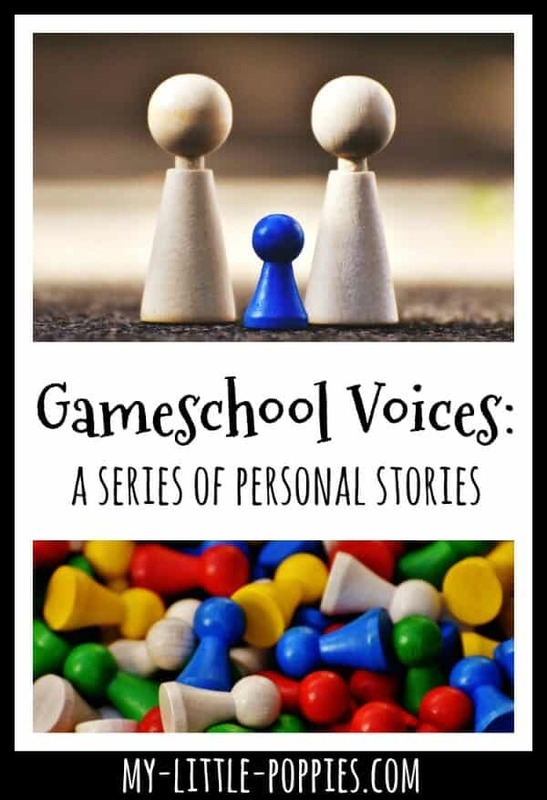 Amy is a homeschooling mama to five boys… and she’s a gameschooler! 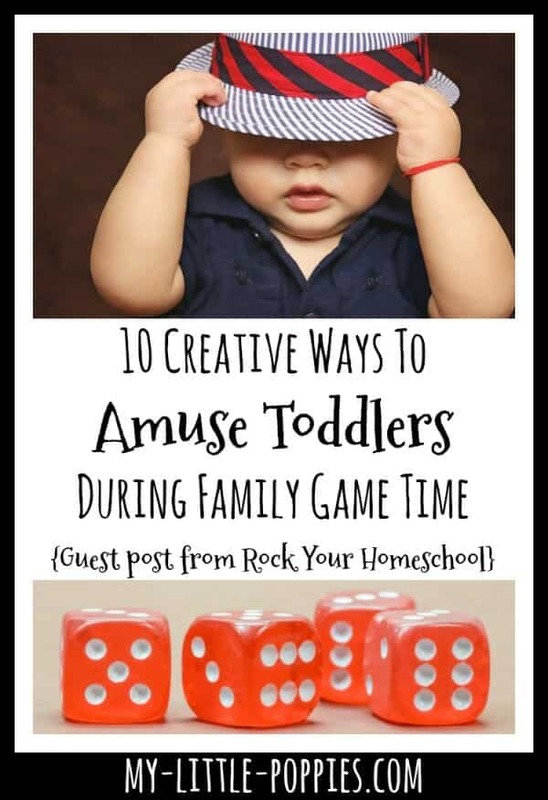 Amy understands what it is like to try to play games with children of different ages and stages and today she is sharing ten creative ways to amuse toddlers during family game time! Playing games with toddlers can be tricky! The presence of toddlers during game time with older kids is like Godzilla in a city, leaving a path of destruction and upset in its wake. The destruction can be swift and happen at the worst of times, like right before a critical move or victory. Tears and wails of despair can arise from both sides, with game participants beside themselves with grief and toddlers bawling in confusion. 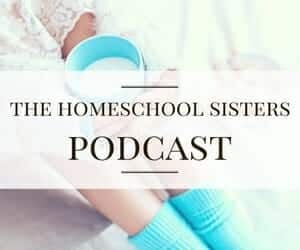 This scenario has played itself out many times in the course of our homeschool family life with five boys. By the time #5 came along, this mama had gathered enough experience to be prepared for a more successful game time with older kids while toddlers are underfoot. 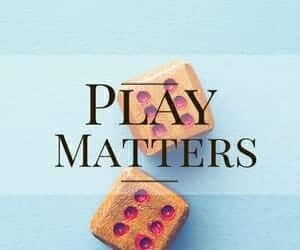 While our game time is still not perfect, it is more enjoyable for all using these 10 Creative Ways to Amuse Toddlers During Game Time. My older two boys spoiled me. We filled our days with quiet crafts, activities, and games. Two and a half years apart, both boys were able to interact without fuss or issue during our family game time. And then, we added three more boys to the crew! My younger three boys are energetic, inquisitive, and hands-on. While my older two are content with a simple explanation or discussion of rules or instructions, my younger three boys do not stop until they have touched, explored, and handled everything in their path. My youngest boy (2 1/2) is commonly referred to as our “toddler tornado”. This child experiences and learns through building and then destroying. He delights in the process of taking apart so he can figure out new ways to piece together. The boys are now 14, 11, 7, 5, and 2. This combination of ages and approaches to learning make for an interesting game time, for sure. All of my boys greatly benefit from gameschooling. So, what’s a busy mama to do? I have learned the art of distraction for toddlers. Not just any type of distraction. This distraction involves hands-on and engaging activities that allow for independent play and learning. Toddlers can be present during your game time with older kids. The key is to find activities that will capture their attention and give you time to enjoy gameschooling. Before I share these creative ways to amuse your little ones and toddlers during game time, I must give this piece of advice. You know your kids best. Only select activities that you believe would be safe and appropriate for your child. I always have my toddlers and little ones in the same room as where our game time occurs. I am able to better relax and enjoy our games when I can keep an eye on all of my boys. If necessary, I can provide assistance or correction for safe play with these creative activities. My younger boys love to take out our old CD player and kids CDs. They plug-in a set of headphones for a fun time of singing and dancing. Great distraction while you get your game time on with older kids! This squishy substance is a staple in our homeschool. 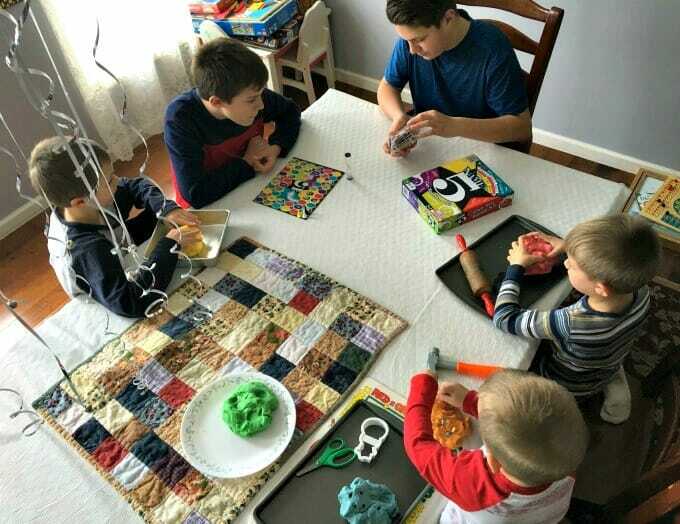 To contain the potential mess of [easyazon_link identifier=”B00JM5GW10″ locale=”US” tag=”mylitpop-20″]playdough[/easyazon_link] crumbs, my younger boys keep their creations on old cookie sheets or plastic trays. They are free to create at will or I will challenge them with designing a new game piece or character to coincide with the older boys’ game. A popular activity for my toddler and younger boys requires only contact paper and random scraps of paper. I cut a length of contact paper about twelve inches long and place the adhesive side up. My older boys will cut scraps of construction paper from homeschool art projects are cut into a variety of shapes and sizes. The younger boys have a blast creating a new masterpiece while game time occurs. Another art project involves old magazines (or newspapers), glue stick, and paper. My younger boys flip through old magazines and rip out pictures, letters, and numbers that grab their attention. They can glue their finds onto the paper or create a pile to complete their collages with mom. If your child is old enough to use child-safety scissors, this activity is a great practice opportunity! Super safe way for toddlers to keep busy! My younger boys use either our [easyazon_link identifier=”B001TJ2Q08″ locale=”US” tag=”mylitpop-20″]felt board[/easyazon_link] or a large piece of loose felt. Pieces of different color felt in different shapes and sizes are arranged into a beautiful creation. I have created felt theme bags over the years. The boys prefer, however, to use random small pieces of felt to make their own arrangements. With the potential to be used over and over, a [easyazon_link identifier=”B00MC7TC6M” locale=”US” tag=”mylitpop-20″]chalkboard[/easyazon_link] is a fantastic way to keep a toddler busy. A small chalkboard with a few pieces of chalk and eraser can provide just enough time for you to fit in a game or two with your older kids. Sometimes, my boys like for me to draw a silly figure or words on the chalkboard to be rubbed off with their fingers. Colorful and safe for older toddlers (who no longer place items in mouth), pom poms can be used in a variety of ways to distract toddlers. 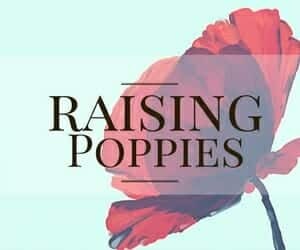 Arrange different color cups or containers and encourage your child to drop the appropriate pop poms in. An empty egg carton can turn into a rainbow collection of pom poms. 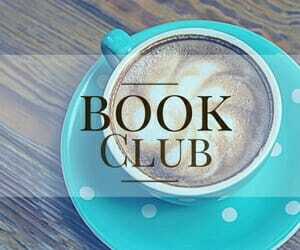 Take out a favorite board or picture book and show your child how to match pom pom colors to the pictures. I don’t mean actually coloring on the floor! When we place a large piece of white butcher paper on the floor and set out crayons or washable markers, we call it floor coloring. Using masking tape to gently adhere paper to the floor. Let your little ones make a grand creation as you have time for games with older kids. If your older kids do not mind the mild distraction, allow your younger ones to commentate with [easyazon_link identifier=”B00JBIY0MG” locale=”US” tag=”mylitpop-20″]puppets[/easyazon_link]. Before game time, have a special craft activity with your toddlers and make paper bag puppets. Simple finger puppets are a great alternative. We have even convinced our younger boys to sit in a box and put on a quiet puppet show during game time. An easy way to contain the toddler tornado! Speaking of boxes, don’t throw them away! 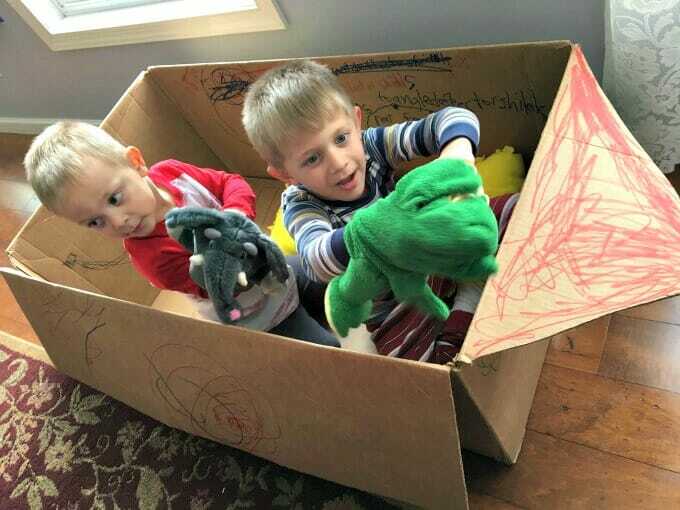 Cardboard boxes can keep your toddler amused for hours (well, at least minutes!). Inside or outside the box, your toddler can decorate with crayons, markers, or stickers. Smaller boxes can be transformed into parking garages or dollhouses. Larger boxes can become race cars, rocket ships, or play houses. Let their imaginations soar while you gain precious time with your older kids. I hope at least one of these suggestions to amuse your toddler can help you enjoy game time with older kids. Add your creative ideas to this list to inspire other moms for successful gameschooling with toddlers underfoot. Do you love board games, too? Now, it’s your turn. Tell me: How do you play games when you have children of many ages and stages? Share here! My best tip is to let them “play” the game with you. For example, older kids (6, 7, 8) were recently playing Hedbanz. 3-year-old wanted to play, too, but doesn’t understand how to follow rules yet. However, she was content to wear a headband, look at her card (that you’re not supposed to see) now and then, and play with dolls beside us. The hardest part was convincing rule-following 7-year-old that that was ok.
We call our 18 month old “Captain Destructo!” Play doh is a current favorite or giving her a big bowl of beans/buttons/dried pasta. Such good ideas! Having two tiny ones underfoot is what makes it hard for me to decide to play games during the day with my older ones. I’ll have to try these! I have rolls of contact paper hat I had assumed were useless until now! I can’t wait to try that out during our next game time.